After being nearly washed out on Halloween Night, Hollywood Gothique decided to revive its dampened Halloween spirits with a follow-up Halloween Haunt Odyssey on Saturday, November 1. We visited an old favorite in Burbank and a trio of haunts in Santa Clarita, including one new discovery that was almost worth the drive on its own. Read on for details - if you dare! We began by heading northwest to Santa Clarita for a home haunt returning for its sophomore session after making its debut in 2013. 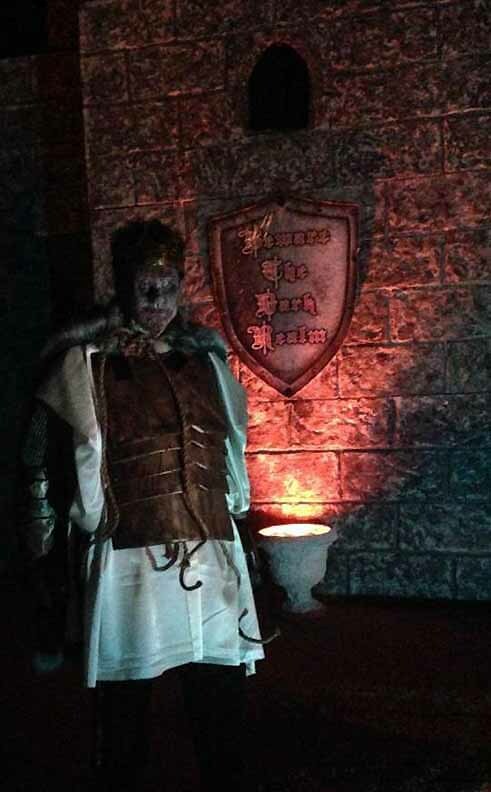 Beware the Dark Realm is the work of the father-son team of Scott and Christian Sivley, who summoned spirits at the Heritage Haunt Halloween Attraction for several years. Though an amateur effort, it features professional quality work, including a wonderful castle exterior, great sets, and impressive makeup. When we arrived, there was a crowd on the sidewalk; even the day after Halloween, Beware the Dark Realm was pulling in an eager audience. The two-story castle facade (Medieval rather than Gothic) eclipsed whatever domicile was hiding behind it, creating a wonderful illusion of walking into an authentic environment. Inside, the haunt began with an introduction in the first room: a video in which the ghost of a king materializes to explain the back story of the castle, leading up to a jump-scare (a blast of air). After that, we traversed several stone corridors (well, actually sets, but in the dark they look reasonably convincing). The creatures we encountered were as good as any you would see in a pro haunt, including an extraordinarily tall werewolf-thing (on stilts) and a zombified version of the King himself, who had apparently been corrupted by the curse afflicting the castle. There were one or two nice moments you don't expect in an amateur haunted house, which usually just send frightened visitors through a series of twists at turns. At one point we entered what looked like a prison, with no apparent exit, forcing us to wait while a character delivered a brief monologue, mocking our predicament; then he finally relented, sliding the (up till then, apparently immobile) bars open, allowing us to proceed deeper into the dungeon. Beware the Dark Room was more extensive that we would have imagined. It took us a while to get through, and all of the scares were directed at us, because only small groups are allowed in. We were impressed by the haunt's ability to sustain its theme for its entire length while still offering a variety of scares. Had we known it was going to be this good, we would have visited the previous weekend; hell, we would have gone in 2013. Like most home haunts, Beware the Dark Realm was free, but the proprietors were asking guests to donate a canned food item for the local Santa Clarita Valley Food Pantry. The haunt's efforts were certainly worth the donation. Hopefully, the Beware the Dark Realm home haunt will re-materialize next Halloween. It really should be added to everyone's list of must-see home haunts. The address for is 28621 Sugar Pine Way, Santa Clarita, CA 91390. Click here for their Facebook page. Monsters lurking within Pumkin Jack's Haunted House. Next, we headed the short distance to Pumkin Jack's Haunted House for a second does of Santa Clarita scares. Eagerly we approached the familiar lawn decorations, inspired by The Nightmare Before Christmas, but the whimsical vibe was soon betrayed as we stepped toward the driveway, above which a Bates Motel sign loomed ominously. A shrouded figure monitored the line, while other characters occasionally emerged onto the sidewalk, menacing passersby. 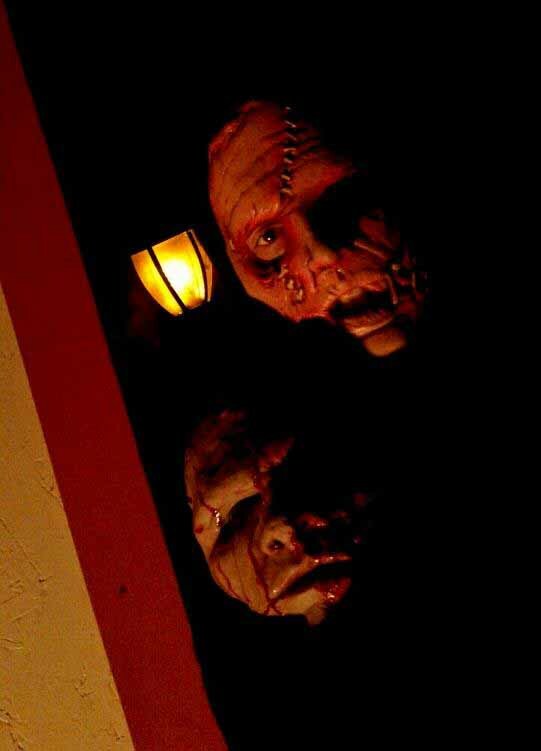 The haunt itself takes place behind a clever facade that creates the illusion of walking into the house's entrance (you are actually going into the garage). Inside there are eight rooms, each housing its own particular nightmare. The labyrinth takes several minutes to walk through - or maybe less, if you run all the way - and the approach was exactly the opposite of Beware the Dark Realm: Pumkin Jack's Haunted House offered a smorgasbord of horrors, with something new and unexpected around each corner - everything from a ghoulish bride urging you to stay with her forever to a mad housewife perpetrating mayhem in a bloody kitchen. The construction and layout are very impressive, housing some cleverly staged scares that rely on a little bit of misdirection (e.g., the shower curtain with a shadow inside that might be a mannequin - or a live actor). We had visited this home effort for our 2012 Halloween Haunt Odyssey: it was good then; it turned out to be even better this year. We had noted some black tarp and store-bought props and masks during our previous visit, but Pumkin Jack's haunted house seemed upgraded this year, with even better sets and more original makeup instead of masks. In fact, Pumkin Jack's Haunted House seems to be undergoing an evolution similar to that of the Rotten Apple 907 yard haunt, which went from being an amusing amateur effort years ago to something much more professional in quality. Which is appropriate, because we hear that Pumkin Jack is considering a transition to a professional haunt next year if the business aspects can be worked out. If not, Pumkin Jack's Haunted House should return to 28603 Natalie Lane in Saugus next Halloween. (Note: For GPS and Mapquest purposes, the haunt is in in Santa Clarita, California 91390.) Click here for the website. Much to our surprise, we discovered a previously unknown Halloween yard display while leaving Pumkin Jack's. Driving away, we noticed some intriguing lights down the street. 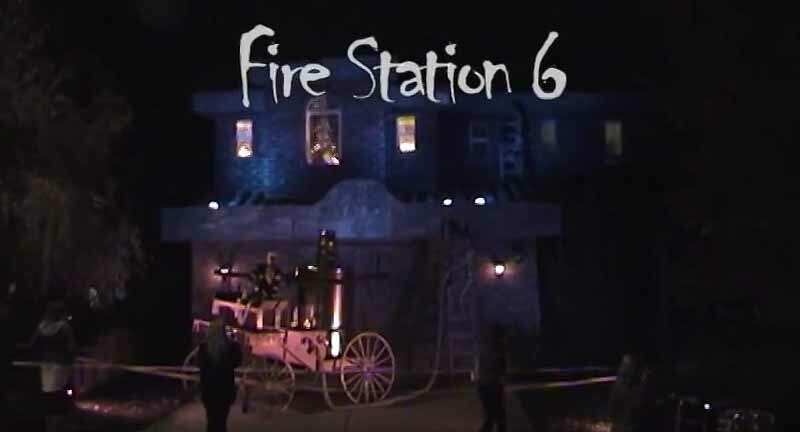 Like a moth drawn to flame, we followed the flickering glow to a haunted firehouse, with a literal skeleton crew of firemen in various shocked poses - no doubt because the firehouse itself was in flames! There was no mechanical movement other than the illusory conflagration (visible in an upper window), but the facade of the firehouse was brilliantly done - on the level of Hollywood Haunter in Glendale. If it returns next Halloween, the Haunted Firehouse would turn the Santa Clarita double bill of Pumkin Jack and Dark Realm into an excellent triple feature. The address is 28540 Agajanian Drive. 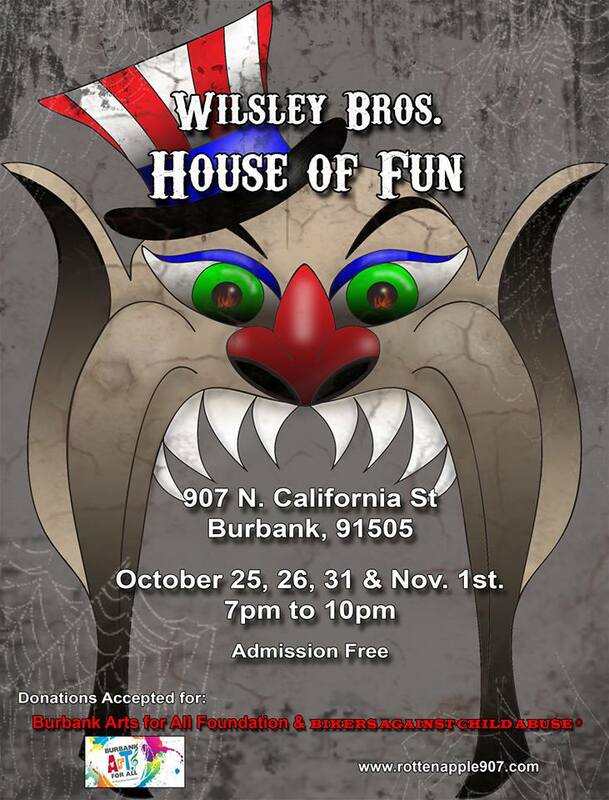 Lastly, we found ourselves with enough time to race back to familiar territory for Rotten Apple 907's presentation of Wilsley Brothers House of Fun. 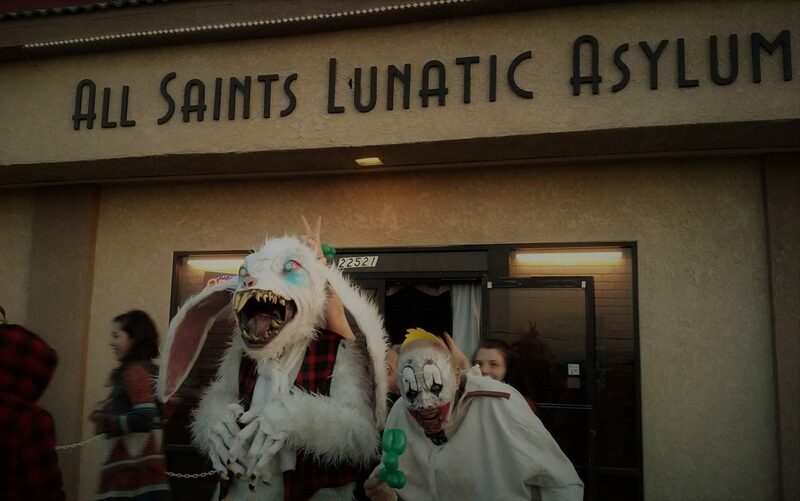 Yes, it was a funhouse theme for Halloween 2014, but the joke was that it was the inhabitants who would have all the fun - terrorizing the guests. As mentioned above, Rotten Apple 907 has been putting on amusing haunts for many years, but during the past few Halloween seasons the annual attraction achieved a professional level of quality that makes each year's new theme worth seeing, no matter how many times you have visited before. As long-time readers know, we are not particularly enamored of clowns and carnivals at Halloween, but Rotten Apple - which has always added a slightly tongue-in-cheek element to its Halloween horrors - exploited the idea with marvelous aplomb. 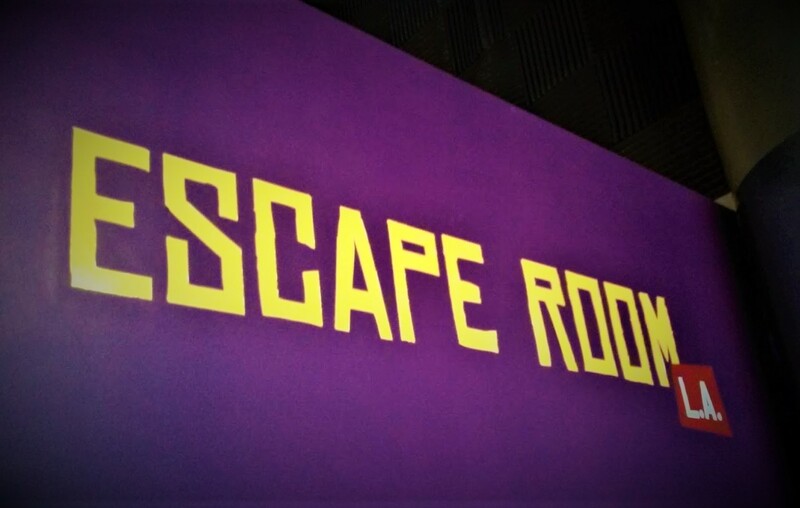 The Wisley Brothers House of Fun was filled with bizarro sights, sounds, and sensory experiences, including some off-kilter rooms with dizzying angles that made it hard to keep your balance and some spongy floor surface that made it difficult to walk. With distractions like these, you can imagine that it was very easy for the demented denizens to sneak up and deliver their scares, chuckling with amusement over the fun they were having at our expense. With our busy Halloween schedule, seeking out new haunts in far-flung locations, we very nearly missed the Wilsely Brothers House of Fun; that would have been a terrible mistake. As always the Rotten Apple 907 Yard Haunt was free, but donations were accepted to benefit the Burbank Arts for All Foundation and Bikers Against Child Abuse. We're sure that Rotten Apple will be back next Halloween. The address is 907 N. California Street, Burbank, CA 91505. Click here for their website. This is the last installment of our 2014 Halloween Haunt Odyssey; however, there are still a few tricks and treats in store for our readers. Hollywood Gothique spent Sunday, November 2 enjoying two family-friendly Halloween events: the Los Angeles Live Steamers Ghost Train in Griffith Park and Rise of the Jack O'Lanterns in Descanso Gardens. We will be back with reviews/photos/video.